Early in June, Adorama announced its Flashpoint Auto Stand, available in 7-foot and 9-foot versions for $59.95 and $79.95. And shortly after, the company sent us the 9-footer for review. Auto Stand. The locking screw. There's a lot to like about the concept of a stand that automatically spreads its legs when you set it down and automatically closes them when you lift it. It makes moving the stand a one-hand operation instead of requiring two hands like the typical stand. A typical stand has a locking screw that must be loosened before the legs will move. 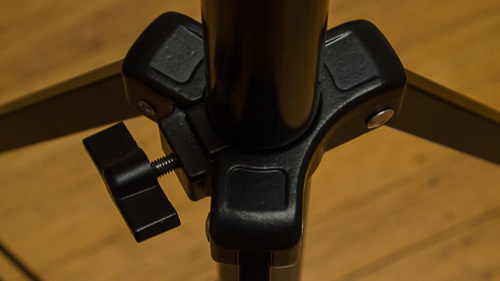 A second hand has to hold the stand as the legs are opened or shut with the locking screw handle. 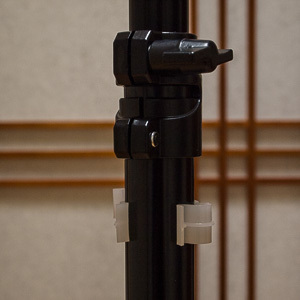 The nine-foot Auto Stand is heavier with thicker sections than the equivalent Photoflex stands and a little more versatile up top with a side mount for the top stud. 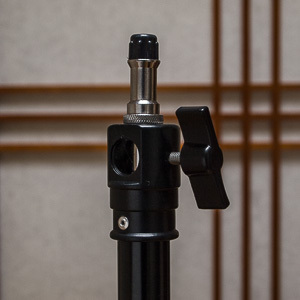 It easily kept our heaviest Starflash monoblocs afloat in the studio. Ready to Go. With the included fabric travel bag. And that's all you really need. 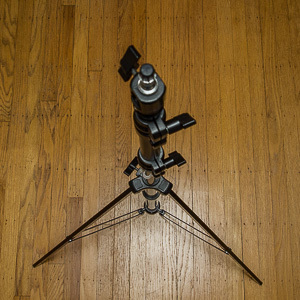 At first glance, the Auto Stand resembles any other light stand you may have had the pleasure of knowing. Several sections, each with their own locking know, three feet attached to the stand with two arms each. Like other stands, the Auto Stand features rubber feet, although the Auto Stand's feet are curved to grab less level surfaces. The legs are not tubular, either, but flat metal. 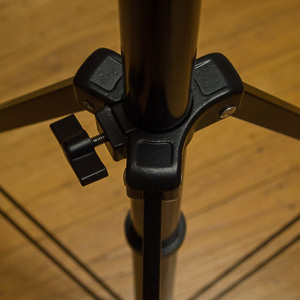 The chief difference in design between the typical stand and the Auto Stand is that the bottom tube is split into two sections with the top end fixed to the collar that attaches to the legs. On a typical stand, the collar with the top of the three legs attached rides up and down the bottom tube freely. As you lift the Auto Stand, the fixed collar lifts the legs as the top half of the lower tube separates from its own bottom half. The legs collapse against the bottom tube. 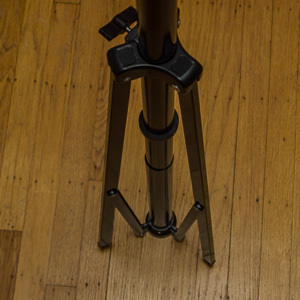 When you put the Auto Stand down, the bottom tube hits the floor while the top half with the fixed collar continues to collapse into the bottom half, extending the legs. Moving the Auto Stand was a breeze but we have to confess that we had a lot of trouble getting comfortable with setting it up. Loosen the locking screw that controls the leg extension at the top of where the three legs meet. Extend the legs until the brake ring stops you from extending them any further. Tighten the locking screw that controls the leg extension while the legs are fully extended. You can then lift the stand and the legs will automatically retract. And when you put the stand down, the legs will automatically extend. So what was our problem? Extending the legs until the brake ring stops them. That was our problem. We wanted to stop short so the legs extended enough but not completely. It turns out you can do that. The locking screw sets the compacted leg position just fine, at least for our monoblocs. The brake holds it securely. To open the legs, loosen the locking screw with one hand and lift the top extensions out of the bottom one as far as (or short of) the brake ring. 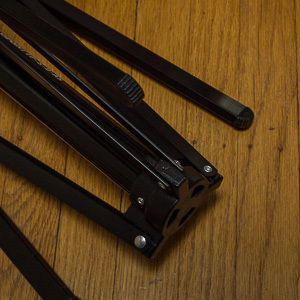 To close the legs, lift the tripod until the legs collapse, unlock the locking screw and let bottom section collapse into itself before locking it up. This method, you'll discover, relies on the bottom of the lower section to initiate on opening and avoid on closing the leg spread. You'll be a master at it after a few tries. So we put a monobloc on the Auto Stand and did a few product shot sessions with it over a period of several weeks. We had no problems with it. 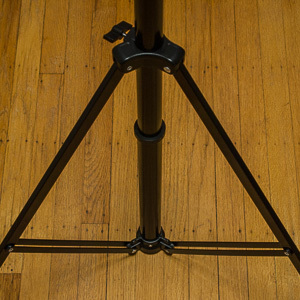 It held a variety of monoblocs securely and made it as easy to position and work with them as any other light stand. But when it came time to move the stand, the Auto Stand was a blessing. We simply picked it up with one hand and put it down where we wanted it. 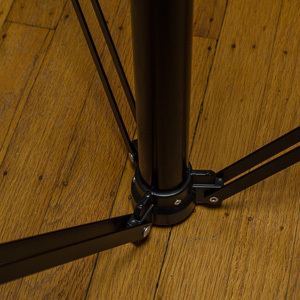 The non-abrasive plastic feet and column base did not scratch the hardwood floors in the studio and the extensions did not bend under the weight of our monoblocs. We refer to the unit as the Auto Stand but you'll also see it referred to as the AutoStand. Adorama itself refers to it in its press releases as the Auto Stand but uses both forms on its product pages. It's obvious where we stand on this controversy. But we thought we should point out the discrepancy in case you're inclined to do further research on the product. The $10 introductory discount has long passed by now. But the price is still reasonable. The Flashpoint 7-foot Auto Stand is $59.95 while the Flashpoint 9-foot Auto Stant is $79.95. We've found the Auto Stand to be an ingenious solution to the problem of moving a light stand around. It would be only a convenience, however, if it weren't for its sound construction and thoughtful amenities. It's probably the best stand we have in the studio. And it's certainly the most convenient. And would be the first we'd load for any job outside the studio. Consequently we've awarded it all four photo corners. It makes our life just a bit easier -- and you can't say that about many things these days.